Kruger Park & Victoria Falls Safari. Combine the Big 5 wildlife of the Kruger National Park and Victoria Falls into a lodge safari tour. > Highly flexible and custom designed tour, combining the magnificent Victoria Falls with your wildlife safari to the Kruger Park. > We can put together a complete package for you, with flights from Johannesburg included, and a choice of great accommodation options on the Zimbabwean or the Zambian side of the falls. > Flexible travel dates designed around your departure times and budget level. > No long road trips, as you can easily do the short flights between destinations. > This safari vacation package is all tailor-made for you. > Even Cape Town could be included in this safari. There is a wide range of hotels and lodges to choose from, to suit various budgets. Please tell us what your interests and requirements are, and we will put a competitive quote together for you. 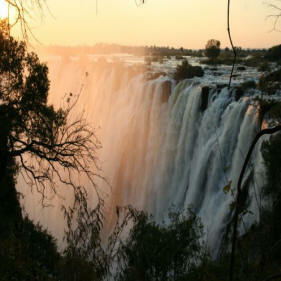 We recommend spending at least 2 or 3 nights at Victoria Falls to make it worth the cost of flying there. It is a two hour flight from Johannesburg. HOW SAFE IS VICTORIA FALLS? Victoria Falls is as safe as ever. As a destination Victoria Falls has always been shielded from the political and other problems facing the rest of Zimbabwe, so don't let negative reports about Zimbabwe stop you from visiting this beautiful place. Both sides are safe to visit. Apart from visiting the falls, activities in the region include game viewing by boat, sunset cruises on the Zambezi, regular game drives, elephant back safaris, walking with lions, helicopter flights over the falls, bungi jumping, abseiling, white water rafting, canoeing the Zambezi gorge, and much more. Various countries have recently lowered or removed their travel advisories for Zimbabwe, due to positive developments in recent months. This is great news for tourism to Zimbabwe, as we have always maintained that Victoria Falls on the Zimbabwe side is perfectly safe to visit. 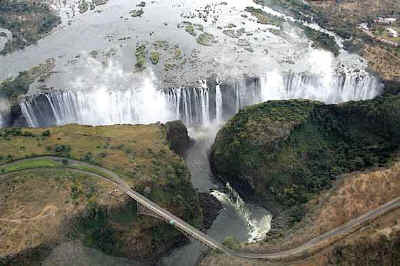 The falls are as spectacular as ever, and the Zimbabwe side is certainly worth the view. During October and November, there is hardly any water on the Zambian side and we would strongly recommend that you visit the Zimbabwe side instead. The Zimbabwean side of Victoria Falls offers great value at the moment, and there is no reason you should not consider visiting this beautiful area. For expert advice and unbeatable rates, please contact us for a quote if you are planning to visit Victoria Falls. OUR PRICES ARE ALL-INCLUSIVE OF NEARLY EVERY-THING YOU MIGHT NEED WHILE BEING ON TOUR, AND ALL COSTS WILL BE CLEARLY STATED IN YOUR COSTING.